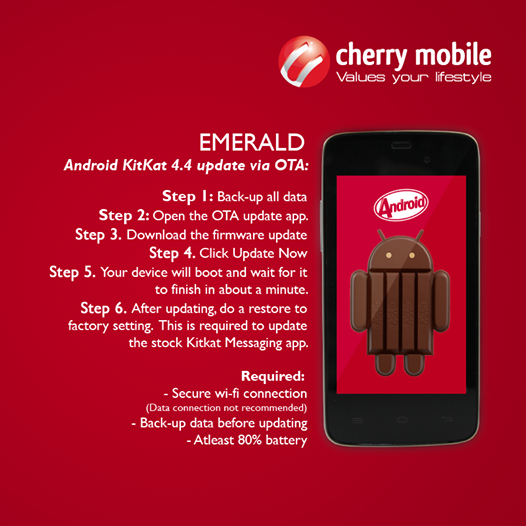 How to update Cherry Mobile Emerald to Android KitKat 4.4? Alongside the Flare S2, the Cherry Mobile Emerald is also up for a KitKat treat from the local company. You can now update your device to Android 4.4 KitKat. Before updating, you need to secure a WiFi connection and atleast 80 percent battery. Step 5: Do a reset factory setting to update KitKat stock messaging app. Pinoy Metro Geek: How to update Cherry Mobile Emerald to Android KitKat 4.4?